After being indicted by the Justice R.S. Pathak Inquiry Authority in the Iraqi oil-for-food scam, former External Affairs Minister K. Natwar Singh, suspended from the Congress along with his son Jagat Singh, was today issued notice by the Enforcement Directorate seeking his reply. The flood situation in Jammu and Kashmir continues to be grim with incessant rains cutting of Kashmir valley from the rest of the country for the third consecutive day today. 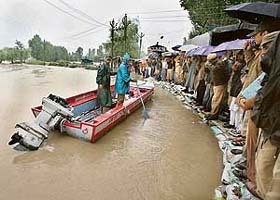 Policemen get ready to evacuate trapped persons from a flooded locality in Srinagar on Sunday. There is a certain degree of concern over Pakistan Army’s reported activities of construction of concrete bunkers and reinforcement of manpower along the Line of Control as Islamabad is upping its ante before the anticipated bilateral meeting between Prime Minister Manmohan Singh and President Pervez Musharraf on the sidelines of NAM summit in Havana barely a fortnight later. Even as the village panchayat handed over 11 youth of the village, accused of injuring dozens of Dalits with sharp-edged weapons and ransacking their houses on Friday night to the police here today, more than two dozen panic-stricken Dalit families have already left the village. Pakistani militant Akmal Hashmi who was brought to Mumbai has been charged with being part of the conspiracy to carry out the July train blasts here. Police claim that Hashmi has provided information about 17 men trained by Lashkar-e-Toiba to carry out the seven bomb attacks in Mumbai's trains on July 11. The Principal Accountant-General (Audit), Punjab, has come down heavily on the state government for its failure to control the mounting losses in various statutory boards and corporations. In a communiqué to the state government, the Accountant-General has pointed out that 18 out of the 32 corporations and companies in which the state government is a majority shareholder are running in losses. Sourav Ganguly today failed to make a comeback to the national cricket team with the selectors ignoring him along with ace spinner Anil Kumble, paceman Zaheer Khan and batsman VVS Laxman for the prestigious ICC Champions Trophy to be played in India in October-November.